Every June, the nation comes together to celebrate and honor the 1969 Stonewall Riots in Manhattan, New York, which were a tipping point for the Gay Liberation Movement in the United States. This is why the last Sunday in June was initially celebrated as “Gay Pride Day,” and in major cities across the U.S. the day soon grew to encompass a month-long series of events. Today, LGBTQ+ (Lesbian, Gay, Bisexual, Transgender, and Queer) Pride Month celebrations include pride parades, picnics, parties, workshops, symposiums and concerts, and attract millions of participants around the world. Memorials are held during this month for those members of the community who have been lost to hate crimes or HIV/AIDS. The purpose of the commemorative month is to recognize the impact that lesbian, gay, bisexual and transgender individuals have had on history locally, nationally, and internationally. Last June, the City of Annapolis made headlines when Mayor Gavin Buckley signed a proclamation declaring June as the city’s first LGBTQ+ Pride Month. We sat down with Jeremy Browning, the founder of Annapolis Pride and staff member of the Alliance for the Chesapeake Bay, to ask a few questions about his experience working with the city to embrace diversity and to bring pride to Annapolis. Why was it so important to establish Annapolis Pride Month and the Annapolis Pride Organization? "It's really important because, while there are 600,000 plus people living in Anne Arundel County, there has been no organization to bring people together around Pride like other cities do. We wanted to create a central meeting space for the LGBTQ+ community, which is important for visibility and awareness for those who feel alone and isolated – those who do not feel welcome. The hope is to build a community of shared resources and safe spaces as well as a calendar of events to promote. We want to be a bridge between the LGBTQ+ community and local businesses to include events where everyone can get involved." What does the acknowledgment of our local LGBTQ+ community mean for all of us? "It is a huge deal that the mayor and local government acknowledge that harassment and discrimination cannot be tolerated. This is a powerful message. They recognize that we are marginalized. By acknowledging the existence of the LGBTQ+ community with in our society, we acknowledge the impact LGBTQ+ individuals have on community businesses and the overall structure of Annapolis. As a marginalized group, it is important that we have the support of the establishment and the police force to truly validate our place in Annapolis culture." Did you all face any struggles or resistance in the mandating of Annapolis Pride Month? "Thankfully, no. A letter was sent in May asking if the City of Annapolis would declare June as pride month and we got a call back two hours later with full support. We’ve already received feedback on social media that so far Pride Month has been well received and everyone has been very supportive. We recently experienced some ignorance, with folks making comments like “you already have gay marriage what else do you need,” but people who are not a part of the LGBTQ+ community may not know what it’s like in the day of a life of a LGBTQ+ person and that it takes extra support to bring equality to marginalized groups. So far, we are very grateful that there are been no strong resistance." Are you surprised by how Annapolis Pride has been received? "Very surprised, but Gavin has been a long time supporter of the LGBTQ+ community. The letter was sent just days before Pride month started in June. It felt like they were ready. They called back in two hours and June 19, 2018 was decided as the proclamation party. Everyone wanted to make a big splash so we hosted it somewhere local versus City Hall. Claire Drapeau, a seventh-grader at Crofton Middle School planned the Pride Walk with the city. I was delighted that they were so supportive. In the past there was resistance, but I think that if Gavin wasn’t Mayor we would be facing more, but that’s also hard to say, because when we were first speaking to the Mayor’s office I was thinking very small scale and they were the ones who pushed for a parade and festival next year. “We want all people here to feel welcome” they told us." What do you look forward to most about Annapolis Pride Month in 2019? "We look forward to bringing the entire community together, not just LGBTQ+—allies, the community, businesses, and all Annapolitans celebrating as one. There are a lot of LGBTQ+ people in Annapolis, but in the past they have had to go to DC or Baltimore in more urban areas to find hubs of the LGBTQ+ community and we hope that this makes it possible for them to feel they do not need to leave to find somewhere to belong. We are excited to host and promote events, as well as to see other organizations create and share their events. We want local businesses to see that this is the right thing to do. Now that this month is more established, we can also make things more out and colorful in 2019, with many more rainbow flags next year. We are excited for youth, transgender and minority people to come together in 2019. There is not a central meeting place in Anne Arundel County, no "gayborhood" and no designated gay friendly area. I wouldn’t feel comfortable walking down Main Street holding hands with my partner. Many people I’ve spoken to share the same sentiment. By creating events, picnics, and visibility, there is a truly safe space for the LGBTQ+ community." What kind of future do you envision of the LGBTQ+ community of Annapolis? Do you hope this will affect LGBTQ+ youth growing up in Annapolis? How? "In summer 2017, I saw a rainbow flag at the St. Luke's Church in Eastport, and that was the first rainbow flag I had ever noticed in Annapolis. Why is that the first one we’ve seen here? It’s now 2018, so you’d think there would be more by now. There were challenges in my personal and professional life as a gay man encountering those who might not be open to people with a lifestyle like mine. I thought it would be great to have a pride in Annapolis, so I started laying the ground work. At the end of May, we launched a Facebook group that now has over 3,300 followers in short amount of time, and through this community we are already planning for 2019. 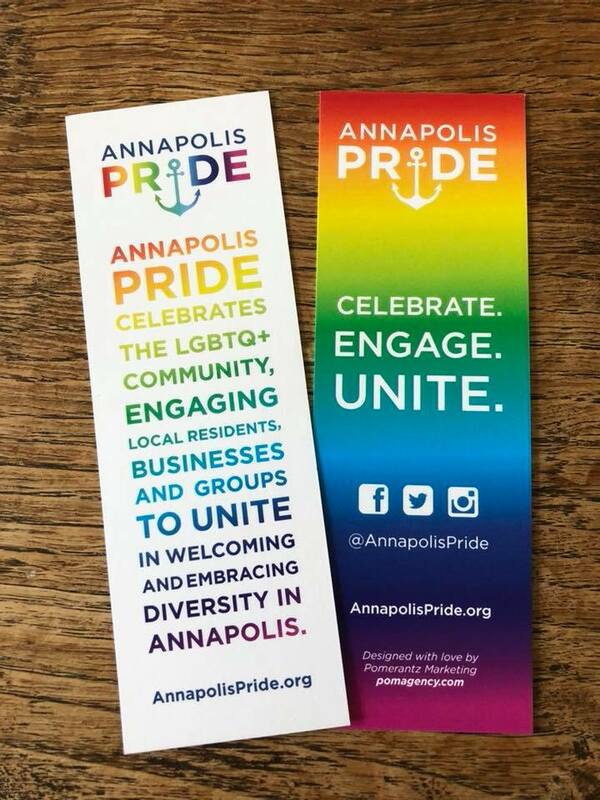 We like the idea of “one Annapolis” where we are all together and we are all equal - no matter your race, sexual or gender identity. We hope that one day we won’t need a pride and that feeling equal and welcomed will become interwoven in society. This Annapolis Pride movement is the most important for Queer and questioning youth/adults. Through visibility, they may realize they are not alone. The more resources that are available in schools and communities, the more comfortable queer and questioning youth they will be exploring and accepting themselves. Growing up here, there was nothing, and a lot of people still feel isolated and alone. I want them now to grow up knowing we have resources here. Someone who is 15 or 16 might not be able to go to more urban areas and discover a Queer community they can join, so we must make their hometown safe and accommodating. There is no time like the present – and the rights that the LGBTQ+ community has worked so hard for could be taken away. Minorities are always at risk when the majority decides their rights. We cannot just be complacent and think that everything will be fine when there are people actively working against everything we have created. It is important that we stay vigilant and active in our community." How receptive has your workplace been to Annapolis Pride? 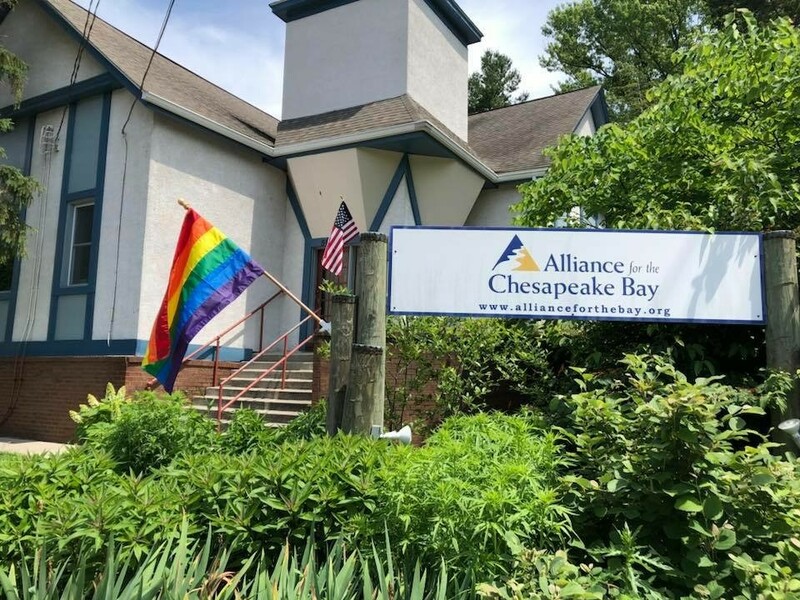 "The Alliance for the Chesapeake Bay has been very supportive of Annapolis Pride, even providing free meeting space. Our Executive Director, Kate Fritz, is a strong ally and truly understands the importance of inclusive and safe spaces. It was Kate's idea to put the rainbow flag on the corner for Pride Month. This really touched my heart and made me even more proud to be a part of the Alliance family. We need strong allies and increased visibility. The rainbow flag is a symbol of inclusiveness. As a society we have made leaps and bounds to gaining equality, but the LGBTQ+ community still faces discrimination and harassment." What advice would you give other organizations who are looking to create safe spaces for LGBTQ people? "Be a leader, be an ally. If you support equal rights, be vocal, be visible. Show your support. Invite LGBTQ+ staff, members, partners, allies to share their thoughts. Ask what your organization and community needs. When Kate Fritz, said we should put a rainbow flag out on the corner, I was nervous. I didn't know what the reaction would be. Before we put the flag up, I asked Kate if she had any concerns about upsetting board members or sponsors and she said, without hesitation, "No, I'm not concerned because it is the right thing to do". Stand up for those who may not be strong enough to stand up for themselves. Inclusiveness and equity for all is not just the right thing to do, it also makes organizations and communities stronger. Don't let fear stop you from doing what is right." Jeremy Browning is the development and executive administrative assistant in the Maryland & DC Office of the Alliance for the Chesapeake Bay. On a beautifully bright Sunday afternoon, 241 volunteers from two faith-based congregations in South Baltimore’s Brooklyn neighborhood, joined in fellowship and stewardship as part of an Earth Day celebration. - Maintenance of a 604 square foot native garden planted by both congregations in previous years. This marked the first of 4 debris cleanups within the Masonville Cove watershed that TAYR will lead as a part of the Patapsco Latino Action Network (PLAN) project. Currently funded by the Environmental Protection Agency’s Environmental Justice Small Grants program, this National Aquarium project looks to inclusively address the problem of marine debris in the watershed by engaging Latino volunteers and community members in hands-on marine debris cleanup events, facilitating community-led comprehensive strategies to address debris problems, and building the capacity for Latino community members to develop leadership skills focused on the long-term reduction of marine debris. The National Aquarium’s connection to the Masonville Cove watershed stems from its involvement in the Masonville Cove Urban Refuge Partnership, one of the first in the nation as designated by U.S. Fish & Wildlife Service. What once thrived as a beloved community natural area in the 1940s, became a neglected area of shoreline overrun with invasive species and debris. The Maryland Port Administration, in partnership with Living Classrooms Foundation, U.S. Fish & Wildlife Service and the National Aquarium have worked collaboratively to design an area that would initiate meaningful stewardship opportunities for neighborhood families and engaging programming to connect those individuals to the natural world within their own backyard. The Aquarium led efforts to engage community stakeholders, including residents, local environmental non-profit organizations and city officials, creating opportunities for people to identify and address key environmental issues or interests. These interests include issues such as debris accumulation and community greening, within the surrounding communities of the site. This Small Watershed Action Plan (SWAP), which was an initial product of these community engagement efforts, has served as a critical guiding piece as part of our community engagement efforts. The Aquarium recognized that in order for these efforts to be successful, they had to be viewed through a diversity, equity, inclusion and justice lens. One critical priority of this overall effort was the need for outreach, engagement and programming for Latino families in the community, which represented a growing demographic within South Baltimore. 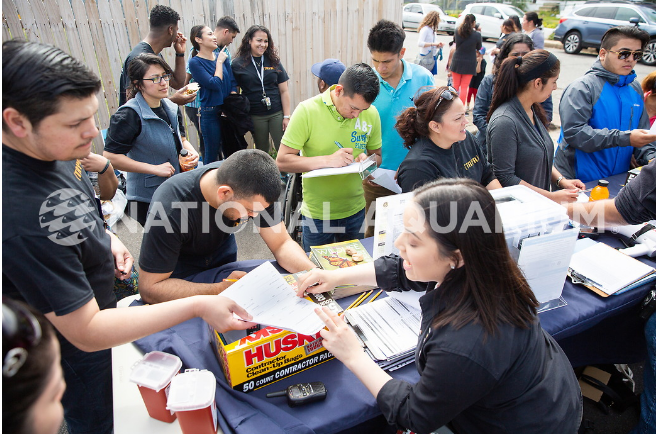 According to the Maryland Department of Legislative Services, from 2000 to 2012, the Hispanic population grew by almost 125 percent throughout the state and by 150 percent just in Baltimore City. The Aquarium, through the implementation of a community pillar approach, has been purposeful in engaging Latino families within the community. From the onset, TAYR not only expressed their desire to become involved in community stewardship projects, but also connect and engage with other local Latino families, building this larger network. Thus, through the PLAN project, the Aquarium looks to not only support, but build the capacity of TAYR to develop these transformational relationships with other local Latino groups and families. The ultimate outcome of this “train-the trainer” methodology, is the empowerment of the congregation to lead community stewardship initiatives. This year the Masonville Cove Urban Refuge Partnership in collaboration with TAYR and HAF, hosted its 2nd ever Latino Conservation Week event! Inclusivity was the uniting theme of this programmatic effort, from the planning onset we knew that TAYR was not available during this actual week, but that didn’t stop us. Driven by a collective desire to celebrate Latino culture and engagement, we planned accordingly to host an event on Sunday June 24th, during which over 80 TAYR congregants had opportunities to participate in guided nature walks, creature features, fishing and safe archery programs, as well as design t-shirts. Blog written by Curtis Bennett and Andrea Van Wyk, formatted and edited by intern Mary Katherine Sullivan. Formed in 1971, the the Congressional Black Caucus Institute (CBIC) has been an influential voice for people of color in the American government. Using their leverage in politics, these inspiring people have worked to fix economic, social, and political disparities faced by their communities. Specifically, CBCI’s work includes, but is not limited to, reforming the criminal justice system, pushing back against voter suppression, making top of the line education available for everyone, and eliminating racial health disparities. Our own Mariah Davis, field manager for the Choose Clean Water, has been accepted to the CBCI Political Leadership Training – a program that creates strong and experienced future leaders. We sat down with Mariah to ask a few questions on her application to this program. Why did you apply to join the Congressional Black Caucus program? What drew you in? I decided to apply for a political leadership program, or at least was drawn to one, once I started to dive into my environmental career. I saw an alignment between the conservation movement and politics that I really wanted to explore. I was searching for a program that would not only help me build my skill set, but one that would challenge me and fit into my current campaign work. I was drawn to this program specifically because it works for my schedule and I personally align with the mission of the CBCI as a whole. I did a lot of research prior to applying and explored programs in the greater D.C. metro area before settling in on this one. Throughout my work in the environmental sector, I’ve developed a really great relationship with members of Congress who are also a part of the Congressional Black Caucus. I have worked with Congressman A. Donald McEachin (D-VA) and his staff on multiple outreach efforts over the last few years. Knowing that I already had great relationships with members of Congress involved in the CBCI, I felt encouraged to apply. What do you hope to gain as an individual from this? What do you think you can offer them? I’m really interested in getting to know my peers from around the country who also have experience in campaign work. I think all of their perspectives will be unique, so I’m excited to learn about their backgrounds and skill sets in their respective careers. I’m hoping there will be a great mix of people I can network and build relationships with. This training is meant for those who either want to run for office or for individuals who are interested in supporting campaign work. Over the course of a week, we will develop winning strategies to execute successful campaign plans and fundraising tactics needed to win. Through this simulation, I hope to build upon my existing knowledge to help build out existing campaigns within the Coalition that brings clean water back to the region. In exchange, I can offer a tactful and strategic mindset, combined with a background on environmental justice issues. You mentioned the socioeconomic imbalance in neighborhoods of color, why do you think this injustice exists? How can it be improved or solved? The reality is that racial discrimination has been embedded within our current policies and the way in which the American government is run. Overall, is it very challenging to address the many layers of how we ended up this way. Luckily, there has been an increase in the number of people of color that want to have a seat at the table and become decision makers - this is key to undoing the harmful policies that currently exist. Continuing to empower people around you to vote and to participate in the electoral process is crucial, as well as investments in programs that enable high performing students from undeserved communities to apply for higher education opportunities. From a more political lens, it is important that we support leaders who prioritize their constituents over corporations looking to influence decision making. Congratulations on your acceptance, Mariah! Mary Katherine Sullivan is an intern with Choose Clean Water. It is hard to comprehend that we live in a world where your skin color and/or income level have a significant influence on your health and overall quality of life. The daunting truth is communities of color and low-income communities are more likely to live near a toxic waste site. This is especially the case when these two communities intersect. A 2016 study published in Environmental Research Letters lends credence to the idea of “environmental racism,” showing that the biggest polluters in the U.S. – factories, warehouse and other facilities using toxic substances — are overwhelmingly located in poor, non-white neighborhoods. Another supporting study showed that hazardous waste treatment, storage, and disposal plants also tend to be built in similar low-income, non-white areas. These findings are particularly true for residents living in Baltimore, Brandywine, and many other cities located in the Old Bay state. The role of the Public Service Commission (PSC) is to, “ensure safe, reliable, and economic public utility and transportation service to the citizens of Maryland”. The PSC creates standards and policies that protect the safety of the public by regulating gas, electric, telephone, water, and sewage disposal companies. Maryland residents living near utility and infrastructure works found that they are the last to know about plans and applications for new generating stations or high transmission lines are approved by the PSC. In recent years, residents have voiced their displeasure with the Commission requesting vital reform. Tamara Toles O’Laughlin, Keisha Pollack Porter and Delegate Robbyn Lewis all provided testimony in support of the HB1632 bill. Currently, there is no direct mandate that informs Maryland residents of new development projects located within miles of homes, schools, and local businesses. There needs to be more transparency between the PSC and residents about proposed activities and new plans coming into their neighborhoods. Maryland is an amalgam of various ethnic groups. For Maryland residents whose English comes as a second language, the information found on the PSC website can be inaccessible as it is formatted in English with a great deal of jargon. Even for those who are native English speakers, the lack of plain text on the PSC website creates barriers to accessing the information. The City of Baltimore is one of highest minority populations in the state and continues to face disproportionate environmental injustices. Increasing accessibility to notifications for proposed activities and health impact assessments during proposal review process are two crucial reforms that must be considered for new development projects. Health impact assessments would help ensure that communities are being protected from poor air and water quality. Health impact assessments are essential for public health because they evaluate the potential health effects of a plan or policy before it is implemented through various data sources. Health impacts of proposed activities should be known by the PSC and community members to help with decision making. Protecting communities near these activities is imperative and must be taken more seriously. This year, House Bill’s 0715 and 1632 sponsored by Delegate Lewis focused on introducing accessible notifications and health impact assessments at the PSC. HB 0715 required the PSC to directly notify community members and stakeholders when an application for a Certificate of Public Convenience and Necessity is filed for a proposed activity. This included notices to be easily available online and in terms for average people to understand. HB 1632 demands that the PSC take public health into the consideration of all proposed activity through a rapid health impact assessment (HIA). HIA’s collect data from an array of sources including: stakeholder input, scientific data, and public health expertise. HIAs attempt to identify potential health effects of a proposed policy, project, or plan, and offer recommendations based on possible risks or benefits identified in the assessment. The overall goal for the PSC reforms is for residents to easily gain information about what is happening in their community and know the proposed activities will impact their health. Are you looking to improve your communication and personal skills? Are you interested in developing leadership and management qualities? How about increasing your confidence and reinforcing your own and knowledge? If so, then the Young Professionals of Color Mentorship would be a great fit for you! The Choose Clean Water Coalition values our members, but more importantly the interpersonal relationships that are built when working together. Established in 2016, the Young Professionals of Color Mentorship Program is a united effort to support individuals working in the environmental sector. Our program is intended to provide mentorship to individuals seeking to excel in their careers and strengthen a mentors leadership abilities. Participating in this unique partnership will foster better relationships among clean water partners and will help build a pipeline of diverse leaders interesting in advancing our watershed goals throughout the Chesapeake Bay region. The program will kick off at the Choose Clean Water Coalition’s Annual Conference on May 23, 2018, at the Lancaster Marriot at Penn Square in Lancaster, Pennsylvania. During a breakfast program, potential mentors will be paired with young professionals to begin a journey towards fulfilling a supportive professional relationship. Nominate a young person of color who might want to participate so we can make sure they receive an invitation to our kick-off event OR nominate yourself! This is a short term commitment to foster a diverse and long-lasting community. Sign up today by emailing Mariah Davis at davism@nwf.org. Please note that this program is open to all of our members- regardless of class, race, ethnicity, age, and gender. Recognizing that environmental impacts often disproportionately harm low-income and minority populations, Virginia Governor Terry McAuliffe has created the state’s first Environmental Justice Advisory Council. The council is charged with advising the executive branch on policies to limit harm to disadvantaged communities and those most vulnerable to pollution and other climate change effects, and it comes at just the right time for Virginia, which has big problems facing its citizens. Richmond recently claimed the dubious distinction of being named the “asthma capital” of America by the Asthma & Allergy Foundation of America, topping the list of U.S. cities that are “the most challenging places to live with asthma.” In urban areas, traffic congestion and power plant emissions have been identified as the main sources of air pollution, triggering elevated incidents of asthma symptoms while also fueling stronger and more frequent storms. Black children are four times more likely to be admitted to the hospital for asthma than white children, and Latino children are 40% more likely to die from asthma than their white counterparts, highlighting just one of the effects of pollution that disproportionately hurts minority and low-income children. Nationally, seventy-one percent of blacks live in counties that were in violation of air pollution standards, compared to 58 percent of whites. Similarly, Hispanics are 165% more likely than whites to live in counties with unhealthy levels of particulate matter. The placement of pollution sources near communities of color and the displacement of communities of color to highly contaminated areas, in fact, is a central concern for the environmental justice movement. To state it simply, we do not all breathe the same air. While the Commonwealth is making progress on clean energy solutions that will help limit the health and climate impacts of air pollution (see Virginia’s uptick from 33rd to 29thnationally in ACEEE’s most-recent state policy rankings), too often these solutions aren’t reaching communities that need it most. In Richmond, one-third of black households and more than half of all low-income households have more than twice the energy burden of the average household in the city. The numbers are similar for the Commonwealth’s largest city—Virginia Beach. High energy burdens, which refers to the percentage of household income spent on energy bills, is a justice issue at its core because of its regressive impact on minority and low-income communities. To read the full article, visit NRDC's website here! Last month, Choose Clean Water Coalition Director Chanté Coleman and I had the pleasure of visiting Berkeley, California for the 2017 PGM One Summit. This two day retreat provided a space for people of the global majority working in the outdoors and environmental spaces to heal, learn, and inspire together. Not only was this my first time on the West Coast, but it was an opportunity to meet and connect with other colleagues at the National Wildlife Federation who advocate for social justice in the outdoors. Although, people of color represent 80% of the global majority often times our communities become marginalized and have little representation in leadership. The PGM One Summit was unlike any other, because it gave us the opportunity to celebrate our uniqueness and capitalize on our strengths. Affinity spaces like this are especially important because they allow people of color to have dialogue and interaction that might not otherwise occur. Overall, the outcome was both positive and empowering. The conference itself was quite the bonding experience. Every day, people of color are challenged to meet increasingly difficult and uncertain times with compassion when facing oppression. The “Colors of Compassion Mindfulness Workshop” breakout session was a space for us to engage in mindful practices. We discussed ways in which we self-manage and overcome challenging situations in work spaces. We read excerpts from mindfulness teachers and reflected on our experiences in peace and solidarity. One of the most interesting concepts I heard was from a Latina who spends her free time teaching young women to surf. She described her experience catching big waves as both invigorating and intimidating. When cursing salty seas she felt free, yet… alone. The sport itself is heavily dominated by white men. It’s not only a challenge being a female surfer, but imagine being the only face you can relate to? At times, it can be difficult for people of color to develop a relationship with nature if they face socio-economic disadvantages. By the end of the conversation we learned that Polynesian women were actually some of the world’s first surfers prior to Western expansion. Overall, the PGM One Summit was an enriching experience. My biggest takeaway was building new partnerships and embracing diversity, equity, and inclusion among my colleagues. We thank the National Wildlife Federation for giving us the opportunity to rejuvenate our cultural relationship with nature. Even though people of color make up the global majority we don’t always have an opportunity to come together and celebrate our narrative. Mariah Davis is the field manager with the Choose Clean Water Coalition. “What I am asking is for your willingness to see a part of yourself when you see me.” - Dr. Erica Holloman. It’s a plea that pierced my heart. Dr. Holloman is an environmental scientist and mother of three. She is someone I admire and view as an invaluable partner. But she made me realize I never see her when I look in the mirror. Through our Environmental Justice Workgroup, the Choose Clean Water Coalition is challenging us to address today’s racial justice and civil rights issues, which are a result of centuries of structural and institutional racism and bias. Our call last week when Dr. Holloman called on us to truly see each other centered on what our community, clean water advocates, can do to address the recent police shootings. We talked about creating safe space in our offices for discussions and actions in the field that can contribute to addressing these injustices. It was honest, raw, and insightful. It is imperative that environmentalists take part in the fight against racial discrimination and injustice. Many of us are engaged in efforts to diversify the environmental movement and advocate for environmental justice legislation, because we know that communities of color and low-income communities bear the brunt of environmental pollution. The bigger challenge for many of us as part of a mostly white, mostly upper middle class movement, is to see ourselves in the victims of police shootings and racial discrimination. Wangari Maathai, the prophetic Kenyan environmental and human rights advocate, said “In a few decades, the relationship between the environment, resources and conflict may seem almost as obvious as the connection we see today between human rights, democracy and peace.” It’s these connections, these similarities between our social movements to save people and to save the environment that must become stronger. As temperatures and tempers rise in this increasingly divided nation, we can and must see each other in our shared goals for the planet and the people living on it, not in the phenotypic differences that have artificially divided us. We can and must build an inclusive movement; one that values equity and democracy for all. Our field is chock-full of significant challenges like cleaning up polluted waterways and curtailing air pollution. In the case of the Choose Clean Water Coalition, for which I serve as Deputy Director, we are fighting to meet the pollution reduction goals for the Chesapeake Bay. This includes reducing polluted runoff and minimizing the impacts of natural gas fracking. With all of these complicated problems, I never anticipated that the most significant and troubling issue is not an environmental issue at all, but a societal one: the lack of diversity, equity, and inclusion (DEI) in the Chesapeake Bay environmental community. This is critical because our success in returning clean water to the region relies on our ability to build our diversity and effectively work with those from different backgrounds. There are countless reasons why we must move toward a more diverse community: diversity makes us smarter; it allows us to be open to things that set us apart; and it can help reduce discrimination. Of course, diversity is generally important, but it is also specifically critical to the success of environmental progress. Second, this is a numbers game. As the number of diverse individuals increase in the United States, our movement will continue to miss out on a growing segment of the population to engage and activate around our issues. Our field relies on numbers; more people are needed to combat the extraordinary amount of corporate dollars that promote private interests over the public good. Third, it is our responsibility to ensure the people working in our field are accepted regardless of background and culture. Creating a diverse and inclusive workplace will help us attract diverse individuals. It’s always fun to feel unique and special, but it gets tiring being the only person of color at every meeting and event. I want to see other people like me and I want to be a part of a movement that is not exclusive. With that said, our end goal is two-fold: (1) the racial make-up of our organizations must reflect that of the communities we serve, and (2) we must engage more diverse communities in a meaningful and impactful way. To accomplish this, our Coalition is advocating for a watershed-wide cultural shift in the way we think about institutional racism, unconscious bias, and outright discrimination. We are not going to authentically address our lack of diversity and inclusivity without breaking down these deep-seated, systemic barriers, and gaining a comprehensive understanding of how they impact the space we all live and work in. Through talking to experts and learning what we can about these issues, our Coalition has made strides toward beginning this shift. We created a tool-kit to help organizations craft governance documents, adjust hiring practices, and shape communications to attract more diversity. The Coalition committed to increasing diversity in our 2016-2017 strategic plan. We also decided that improving the diversity demographics of our annual conference is a priority. At last year’s conference, we collected our diversity demographics for the first time, and let me tell you, it was not pretty. At this year’s conference, we made a conscious effort to incorporate diversity into every aspect. We included an environmental justice track, which featured all diverse speakers. We even facilitated cultural competence training, which helped participants build awareness of how cultural differences impact people in an organization. From last year to this year, we attracted significantly more people of color to our conference. Why? Because we acted intentionally. And, if we can intentionally improve diversity at our conference, can’t we do this in our larger environmental community? The Coalition has finally experienced some quantitative success in the quest for diversity. We believe this success can be scaled up to a watershed-wide level. To accomplish this, the Coalition, in collaboration with the Chesapeake Bay Funders Network, intends to create a DEI plan for our community. This is a heavy lift, so we released an RFP to find an expert to help build our capacity to address DEI and write our plan. This expert will help us build the capacity of watershed organizations to establish mutual relationships with diverse communities and develop productive cross-sector networks to benefit diverse communities. It is vital that our community reach a shared vision on DEI with the goal of using these principles in our work. We want to lead the way; and we hope you will follow. Since starting to work on diversity, equity, and inclusion, I realize that I have many more questions than I have answers; talk about a complicated problem. Growing up in school, there was always a correct answer to the math question or the geography question, but what is the answer to the diversity question. How does our community, the environmental community, become more diverse and inclusive? Hate to break it to you, but I do not have an answer to this question. However, I do have a lot of ideas, and the best way to have a good idea, is to have a lot of ideas. Let’s start with what we want to accomplish. Our end goal is to have an industry that is more diverse and inclusive. This is goal is two-fold: (1) the racial make-up of our organizations must reflect that of the communities we serve, and (2) we must engage more environmental justice communities in a meaningful and impactful way. There are a great deal of differing ideas about how we accomplish this, like posting jobs at historically black college campuses, changing our organization’s governance documents to reflect our commitment to diversity, or setting diversity demographic goals (i.e. our goal is to have one person of color on our Board of Directors in the next year). All of these are great ideas, but are they great ideas for right now? Instead I have another suggestion. Hear me out. I am supportive of a complete cultural shift in the way we think about institutional racism, unconscious bias, and outright discrimination. And we are not going to break down these deep-seated and ingrained barriers until we have a deep understanding of what these obstacles are and how they impact the space we all live in. Through talking to many experts and learning what we can about these issues, the Choose Clean Water Coalition has made strides toward beginning this cultural shift. We created a tool-kit to help organizations know how to craft job postings and know where to post jobs in order to attract more diverse candidates, we committed to diversity in our strategic plan, and we set diversity demographic goals for our annual conference. Another harsh reality, this is not nearly enough. The Coalition keeps plugging along this path to create a change in our community, and we finally experienced some quantitative success and I believe this success can be scaled up to a community level. Over the last year, the Coalition brainstormed how to attract more diverse people to our conference. We self-reflected on our previous conferences and asked ourselves some questions: Is the content of our conference attractive to a diverse audience? Are we giving out scholarships to the right people for the right reasons? Are we using the right channels of communication to promote our conference? Not surprisingly, the answer to these questions was no. The end result of our reflection: From last year to this year, our conference demographics improved substantially. We attracted significantly more people of color to our conference for the first time ever. Why? Intent. As an organization, we decided that changing the demographics of our conference was a priority. Last year, at our 6th Annual Conference, we collected our diversity demographics for the first time, and let me tell you, it was not pretty. However, we did not need to see these numbers on a piece of paper to know we had a problem, and had our work cut out for us. The theme of our 7th Annual Conference was “Clean Water: Bridging to New Partnerships.” One of our goals is to build partnerships with communities that we have not traditionally engaged…and we do not traditionally engage diverse audiences. Every decision we made in our conference planning, we made a conscious effort to incorporate diversity. We changed the content to include an environmental justice track, which featured all diverse speakers. We facilitated a cultural competency training, which helps participants build awareness of how cultural differences can impact people in an organization and motivates participants to rethink their behavior and attitude toward others. We kicked off a Young Professionals of Color Mentorship Program, pairing a diverse pool of future environmental leaders with an equally diverse pool of mentors who will help facilitate their rise to oversee the future of our green community. Our opening speaker was Reverend John Crestwell, a black reverend from the Unitarian Universalist Church. He spoke on the Black Lives Matter movement, and how our movement must be united and inclusive to succeed. Just looking around the room at the conference, there were more faces of color. If we can intentionally improve diversity at our conference, why can’t we do this in our community? The Coalition figured out one way to walk through this world together…and even if it’s just a 275 person conference, we have to start somewhere. And small successes will keep us on a path to greatness. Remember, we all smile in the same language. The racial composition of environmental organizations has not broken the 12-15 percent margin, despite people of color making up roughly one-third of the United States’ population. This issue, what has become known as the “green insiders club” particularly in leadership roles, is a fundamental problem in environmental organizations. Despite our best intentions, our goals and initiatives will not be taken seriously if we don’t look like the communities we serve. With this in mind, The Choose Clean Water Coalition kicked off the Young Professionals of Color (YPC) Mentorship Program during May’s annual conference in Annapolis. The program is aimed at providing guidance and camaraderie to a group of young professionals of color within the green community in order to retain them and help facilitate their rise into leadership positions. Though we at the coalition firmly believe in the importance of this program, it was always unclear how much interest would be generated among candidates. We were more than presently surprised to have eight mentor/mentee pairs attend the kick-off event for our pilot year! This is a testament to the coalition’s overarching goal of assuring more diverse attendance at the conference (we saw a measurable increase in attendees who identified as “non-white,” 17.3% of survey-takers in 2016 over 12.4% in 2015). Participants in the YPC program were fortunate to hear from two powerful speakers: South River Federation Executive Director, Kate Fritz, delivered an inspirational message and Kelli Holsendolph, Director of Marketing and Communications for the Audubon Naturalist Society, recounted a personal narrative on the importance of mentorship. Most importantly, young professionals of color finally met their mentors, the leaders who will guide them over the next six months and who will offer support and answer questions. Handshakes, phone numbers, and stories were exchanged. Smiles and laughter abounded, and there was a distinct feeling that lasting relationships were forming before our very eyes. We were fortunate to see the next generation of leaders of the environmental community all in one room. It is a generation that is passionate, driven, and diverse—just the way it should be.